3:13 - 6:20 is where you'll find me. I voted for the barber shop guys. They were awesome. Oh boy. That's quite something. Good on you for representing the diabolo. I wish I had confetti explosions behind me happening in sync with my diaboloing. Brilliant!! I so hope you win this! I really like you representiing the diabolo on TV . Great performance.. i think these girls love you. Cool! You've got a great personality on stage. Aren't those "fans" just Will dressed up as a girl? On the serious side, this is pretty cool and must be really exciting, being on tv and so on. Well done man. William, your the new heart throb of diabolo. Is there a non-edited one without the crowd anywhere? 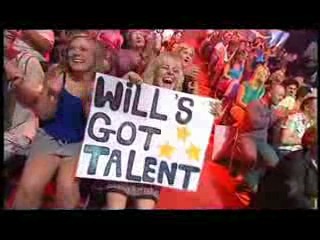 Re: William Campbell - Australia's got Talent! Semi-Finals. get you, well done and such, looks like your in with danni, will you touch her a little bit from me? your miles better than the other two acts shown there! Good performance! Good luck on the show. These two things are legendary. I hate you a little bit but well done! Sickness! Represent! That was an awesome performance, you really worked the crowd, very nice work, great diaboloing, a great performance overall.